Footbag is a rapidly growing sport played and enjoyed by clubs across the world. Footbag can be played both competitively or just for fun. 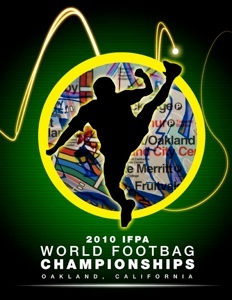 Competitive footbag sports include the grace of Freestyle and the athletic challenge of Footbag Net. Footbag can also be found in your local parks and school grounds being played by millions of people, adults and kids alike. The sport of footbag has reached new levels of popularity in the last few years. Footbag is clearly here to stay, and the market surrounding the sport is growing rapidly. Footbag has spread to practically every high school in the nation. Clubs are spouting up in the United States, Canada, Europe and Asia at a health pace. Footbag started back in 1972 as a rehabilitation exercise and has grown into a global pastime. Footbag Net has evolved from its roots to today's high flying, set and spike fest! Freestyle has grown out of the basic moves into the difficult combinations tricks of today. Over the past years, through the many volunteers across the world, footbag is now ready to burst on the world stage and make an impact on the youth of today. Footbag Freestyle has exploded and is the single fastest growing footbag discipline. Freestyle is a great combination of artistry and unbelievable athletic ability. Players choreograph difficult routines to music, and then are judged in a variety of categories. 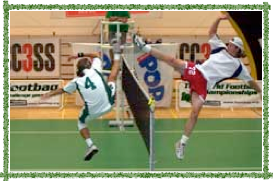 It takes balance, grace and foot speed, combined with body strength to generate the technical maneuvers. The creative possibilities can only be left up to the imagination. A footbag freestyle tournament is presented to the audience as a fast moving, rhythmic experience, something they will remember for years to come. Different freestyle clubs are springing up all over the world bring to the sport a variety of styles and new material that each year expands the scope of the footbag envelope. The aerobic benefits to the motion of footbag ensure the participant of a full and complete workout as well as a fit and tone body.